She's passed an important milestone which deserves to be celebrated! The brunette girl new license personalized Christmas ornament commemorates this moment, and can be a reminder to use her greater independence in a responsible way. These cleverly designed new driver ornaments personalized from Russell Rhodes are customized by our lettering artists who hand paint the details you provide. They'll add a longer message on the back, at your option. 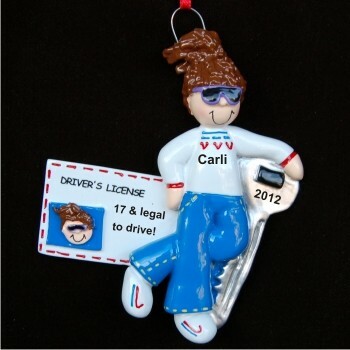 Displaying these new driver personalized gifts for girls is easy with the attached cord. Tell her you're proud of her with the brunette girl new driver personalized Christmas ornament that arrives in our plush velvet drawstring bag. Birthday gift Jan 1, 2018 Jane C.
Christmas gift Oct 12, 2015 Larry O.